Dark and cold outside, cosy and warm inside. Fire lit, heating on, the smell of homely food in the oven… sounds like a night in to me!! During these dark winter nights, it is a difficult time for most people to get motivated to get out of the door to go and train whilst their loved ones are in their pyjamas wrapping themselves up in blankets and turning their favourite T.V show on. So, what makes one person able to make getting out and training look so easy? Why is it that all you want to do is hibernate and other people are getting excited about their training? From experience, even the highly motivated and athletes at the very top of their game have moments of lacklustre and times they would prefer to be sat on a sofa rather than battling the elements in the dark! So how do they manage it? Well, I’m not going to say I have all the answers, I too have been there many a time and still do have times when I would rather snuggle up and go to bed! However, you can put some things in place in order to help you feel more motivated, stay on track and generally get the best out of your winter training this year. 1. Train with friends or a training group/ club. One of the reasons why my husband and myself decided to start up GOG Triathlon Club four years ago was to create a triathlon community in North Wales where like-minded people trained together! We were so use to doing all of our training together that when we had our first child, and not wanting to use up our baby-sitting credits, it was suddenly a big shock to us to have to train on our own. It can become a lonely position to be in and having people to train with gives you that extra boost that you may need to get out of the door. Knowing you would let someone down if you didn’t turn up can be the impetus you need. 2. Get the right equipment to deal with the winter weather. Especially on the bike, it can be really off-putting if you know that you are going to get wet and cold. I’ve been on the bike before now, hands like ice, can’t feel my feet, raining with no rain coat, dripping wet and still have 30miles to get home. Beginners mistake! Having the right clothing certainly helps and gives you no excuses for getting out in the awful weather! I would recommend winter bib tights, a windproof jacket as well as rain jacket, decent pair of gloves, shoe covers, arm warmers, leg warmers and a skull cap for under your helmet. All these things can be bought fairly cheaply if you have an eye for Aldi or are prepared to buy in the sales. This is twofold short term and longer term. Short term. Plan what you are going to do on any given day, then make sure you’re prepared to do it. Early morning run? Make sure you have your kit laid out downstairs the night before so you can change and sneak out first thing in the morning without waking everyone. Going on your bike? Ensure you have spare innertubes, pump, tyre levers, drink and of course your kit ready and in one place so you can get straight out. This may come into your plan, but a race keeps you focused on a goal and gives you a purpose to train. Knowing how you stack up against your peers is always a great motivator! 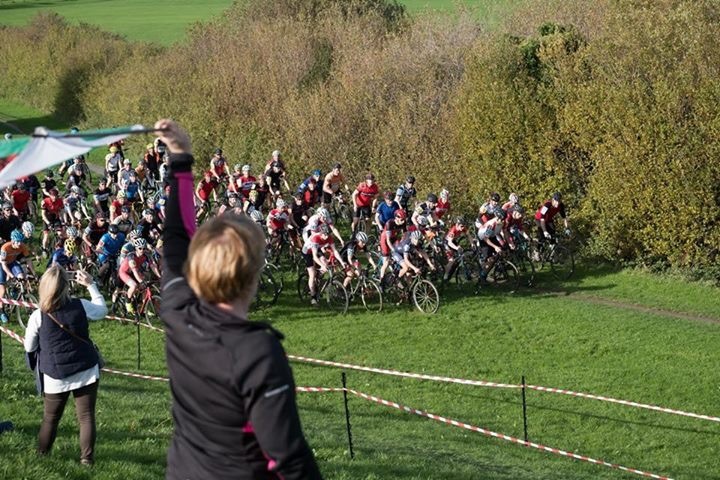 honing my skills at the local Cyclocross race! I mentioned this in my last article for when you are on a rest between racing and getting back to training. Trying something different to give your training variety is very important to keep you interested and fulfil that enjoyment factor. Now, I am talking about doing something a bit more long term. For example, cross-country running. There is nothing quite like cross country! It is full on, full gas from the start and all these very fast athletes seem to crawl out of the woodwork for these events. It is exhilarating and although cross country can sometimes be run in what could only be classed as the worst weather Britain has ever endured, in a sadistic kind of way, cross country running is wonderful! By entering a cross country league during the winter, it keeps you focussed, makes you strong and fast and forces you out of bed on the weekend. But the camaraderie from club mates and other clubs can be both uplifting and inspiring. I did mention before, now’s the time for having a swim stroke analysis session, or focus on drills in your running. Getting off-road on the bike or by foot will train your body in a different way, you will learn to use different terrains, your technical skills are sure to improve. 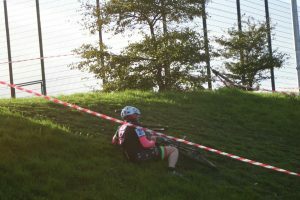 After 12 years of doing Triathlon, I have to admit to doing my first ever cyclocross last weekend. Now, I am not going to lie to you and say it was the best thing I have ever done, but it definitely took me out of my comfort zone, made me do things I never envisaged I would be doing on a bike and overall, I think it has given me extra confidence whilst riding and it’s forced me to bring my technical skills to the forefront of my training for a few weeks, so it can’t be bad! The best bit of equipment I bought one winter was a turbo trainer, I never thought I would enjoy it, but having the right session, it is far more appealing than battling Storm Brian for example. There are virtual gaming apps (e.g. Zwift, trainer road, web racing etc) out there these days claiming to make indoor training fun! I would recommend trialling the app first before signing up to using it. My husband, a recent convert to Zwift, calls it ‘digital Crack’! There looks to be many positives about training using these apps, as long as you can curb the urge to virtual race when you’re supposed to be on an easy ride. Rollers are also great fun if you want a slightly more road like experience, keeping your balance whilst doing your workout, will certainly engage muscles that you may not readily use. There is a lot to be said for training indoors, staying dry and keeping warm!! All your training sessions don’t have to be run, bike or swim. Do some strength training and see how your triathlon improves. Take advantage of the nice weather. It doesn’t come very often, but when it does, do everything in your power to get out in it!! Even if it is nipping out in your lunch hour or sneaking half an hour before picking up the kids or of course organising that all important afternoon “meeting”!! 9. Go on a training camp. Combine it with a family holiday or book a few days with some training buddies in the sun. Nothing better than being outdoors with the sun on your back and the wind in your hair. This will stoke the fire for training without a doubt. For most of us, it is the weekend which gives you the opportunity to train in the day light, especially when the nights really draw in. Sometimes, that can be tricky if you have a family or loved ones who want your time also. Why not share that daylight opportunity to get out and about with all the family? There are ways of doing it, young kids on backs of bikes or in pushchairs, older kids on bikes whilst you are running. Or if they aren’t that way inclined. Take them somewhere idyllic, you can run they can have a spot of adventuring or picnicking! Then meet up afterwards. Anything is possible!! 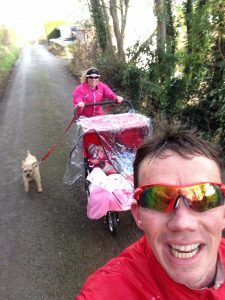 going for a family run at Christmas time! ** If all else fails, buy something new!! Guaranteed to get me motivated to go out for a run, a new pair of trainers! A new swimsuit or goggles will get me back to the pool or a new piece of cycling apparel (lights, jacket, shades…bike!!!) will help me onto the bike!! motivated?! In the short term of course!! Rhian, a great article. One of the things that I do that to mix things up is to ride my cyclocross bike. It’s a great approach because it allows you to mix road and off road, offers more security on the road, and is a brilliant way to improve riding skills. Riding a cross bike off road really helped me learn what a bike could handle in a safe environment – mud is a softer landing than tarmac! 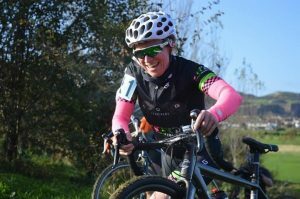 I completely agree, having been on my cyclocross bike this year and last, I have seen an improvement in my own biking skills and confidence!